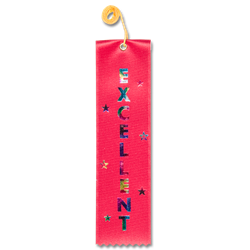 Stock Student of the Month comes printed on Premium Grade Satin Ribbon in a standard color of Grey. Ribbon measures 2" x 8" in size with a Multi Color imprint with Event Card, Eyelet and String. Ribbons are bundled in packages of 25 and can only be ordered in bundles. To mix places to meet minimum quantity levels please call or fax in your orders.